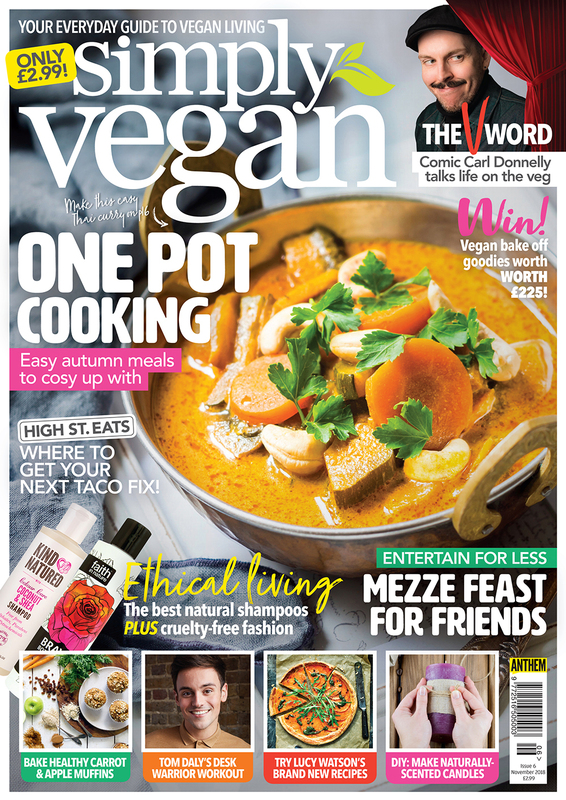 The November issue of Simply Vegan is on sale now! Get set for autumn with the new issue of Simply Vegan, which is packed with hearty recipes for the season ahead. From easy one pot meals to mezze dishes that will wow your friends, you’ll find all the recipes you need when celebrating Halloween, Bonfire Night and beyond. This issue we also bring you the best cruelty-free fashion so you can shop with a clear conscience, along with our must-try selection of natural, chemical-free shampoos. Want to have a go at making your own candles? Our easy DIY shows you how to create vegan-friendly, naturally scented candles to cosy up with as the night gets darker. And if you’re a new vegan, our guide will talk you through what to eat, where to shop and how to stay healthy this winter. Olympic athlete Tom Daly is even on hand to show you how to stay in shape if you’re stuck at a desk all day! Pick up your copy today in WH Smith, Tesco, Asda, Sainsbury’s, Morrisons and Waitrose. Alternatively, you can purchase your copy of Simply Vegan online and have it posted straight to your door. If you’d like to purchase the digital edition, you can find it here.